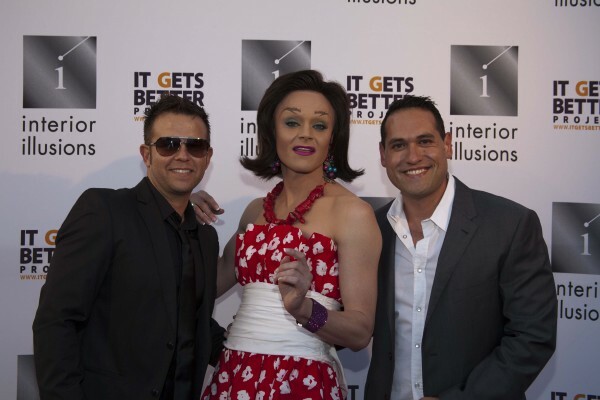 The ‘It Gets Better Project’ kicked off Pride Weekend on Friday night with the grand opening of the new flagship location of Interior Illusions in West Hollywood. Interior Illusions recreated its signature lounge from the popular Ru Paul’s Drag Race series for guests to take photos and videos for the It Gets Better Project, a worldwide movement that was created to show young LGBT people the levels of happiness, potential, and positivity their lives could reach. Contestants from Drag Race made special appearances as well, including Raven, Tammie Brown, Eddie Debarr, Lorayne Love. Other notable attendees included Odain Watson, Jeff Lewis, Greg Travis, Nik Kai and Jonathan Plummer. The It Gets Better™ project also had representatives attending the event who were selling paraphernalia with proceeds benefiting the organization. Interior Illusions is a southern California-based retail, interior design and staging company. Guests at the party previewed some of the newest collections and accessories from the high-end furniture store. It was an amazing evening of cocktails, fabulous furniture, food and entertainment. The new flagship location for Interior Illusions is the second location in West Hollywood for the company, providing full service interior design, staging and custom furnishings out of the showroom. CEO Michael Valles currently operates two other Southern California locations, in Santa Monica and Palm Springs. In December 2009, he opened I Squared in downtown Los Angeles, which caters to his loft-dwelling clientele with an appetite for locally available modern furniture and accessories. Since 1999, Interior Illusions has created dynamic interiors for an impressive list of Hollywood celebrities, tastemakers and top business executives. They have also designed spaces and furnishings for commercial use including the new W Hotel & Residences in Hollywood. In 2009, Interior Illusions was awarded the Annual Arts Award for Top Design Furniture Showroom in the Western United States. The new flagship location for the company is located at 7335 Santa Monica Blvd. in West Hollywood at Fuller Ave.